Rabindranath Tagore’s comedy Shesh Rokkha (Saved at Last, 1926-29) is a multisided farce about the vagaries and uncertainties of love and marriage in traditional India. This play served as the basis for the 23rd and 24th and episodes, “Dhaai Aakhar Prem Ka” (“Make a Love”), of the anthology television series Stories by Rabindranath Tagore (2015), which was under the general directorship of Anurag Basu, with this episode scripted by Samrat Chakraborty and directed by Debatma Manda. In Tagore’s India, and indeed in many quarters of India today, young people had few opportunities to get to know each other before a parent-approved marriage arrangement could be organized. Even when young people were given the choice, they had little information to go on concerning who would be an appropriate marriage partner for them. Indeed, even in the modern world, most people have little idea of what it means to share one’s life with another and how that might affect their futures. In “Dhaai Aakhar Prem Ka” these basic uncertainties are at the foot of an entangled series of misunderstandings that lead, almost, to serious missteps on the parts of the characters . Lalit (Harsh Aggarwal), a relatively modest young man who is distinguished from the others by his preference for Western clothes. Indumati (Sainee Raj), Kamal’s impish younger sister. Given the intertwining plot threads, the story is not really partitioned into acts, but I will somewhat arbitrarily section off the narrative into six parts. 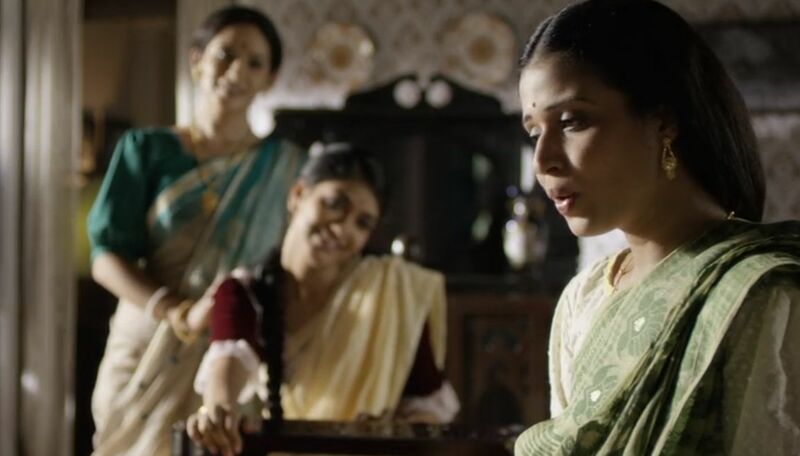 In the beginning, Chandrakant’s group are meeting to discuss poetry, and Vinod is distracted when he hears a woman’s mellifluous voice outside the window singing a beautiful song based on his own poetry. Vinod cannot see who is doing the singing, but the viewer can see that it is Kamal singing from inside her neighboring apartment. “The tears of the night don’t stay on a lotus leaf; they slip off. Sometimes the union is left incomplete. Sometimes all that is left are stories. A peaceful mind was disturbed by a chord of the heart. A symphony of the beloved plays in each breath. Later, Chandrakant’s wife Khantamani (Pradnya Shastri) goes to visit her two sisters-in-law, Kamal and Indumati (aka Indu), where they discuss Kamal’s so-far-unseen love, Vinod. Learning from their discussioon that Indu is just as eager to find a love of her own, Khantamani suggests that two other men from her husband’s discussion group might be good candidates – Gaudai and Lalit. From the outset we see the two contrasting perspectivess on love generally held by the men and women in this story. The men, obsessed as they are with poetry, have a view based on ethereal, poetic abstractions. For them, love is focused on inner feelings and is therefore more self-obsessive. For the women in this story, love is focused on more practical, interactive concerns of the here-and-now. However, we also see that Chandrakant, the one person already married, sees things from a more disenchanted perspective, and he tells his fellow group members that his wife has no element of poetry in her – marriage can be a bore. Unfortunately, Khantamani, from another room, overhears her husband say these things, and this only further contributes to the downward spiral of their relationship. Vinod is so enamored by Kamal’s pretty voice that he decides she must be the ideal mate for him. Even though he has never seen the girl, he forces his friend Chandrakant to support him when he approaches Kamal’s father, Nivaran, (Neeraj Shah) for her hand. 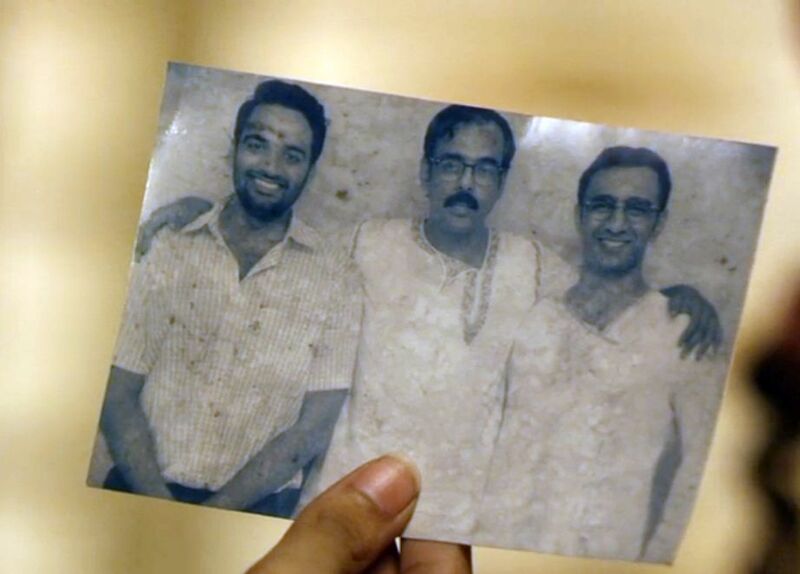 So that Kamal can see who is proposing to her, Chandrakant gives Nivaran a photo, which shows Vinod along with Chandrakant and Gaudai. Later Indu happens to see that photo, and asks Khantamani who is that attractive third person in the photo, (who we can see is Gaudai). Khantamani, who doesn’t have the photo in front of her, mistakenly tells her that the third person must be Lalit. Indu then goes into a neighboring room and sees Gaudai there. Flustered for the moment, she tells Gaudai that she is Kadambani, the daughter of bazaar merchant Chowdhari Babu. But even in that momentary interaction, Gaudai is smitten with love. Even though he has been dedicated to objective science and has up til now seen love as a disease, Gaudai quickly begins writing romantic poetry dedicated to his new beloved, “Kadambani”. We now have cases of love at first sight (or sound), but there is a problem of misidentification. Indu thinks her love (who we know to be Gaudai) is named Lalit. And Gaudai thinks his love (who we know is Indu) is named Kadambani. These parallel relationship threads will be the narrative focus for the rest of the story. Meanwhile Nivaran, on his own, goes to Gaudai’s father, Shibhcharan (Atul Srivastava), and arranges for Gaudai marry Indu. This should be ideal, but it won’t work, because Gaudai thinks he wants Kadambani, and Indu thinks she wants Lalit. 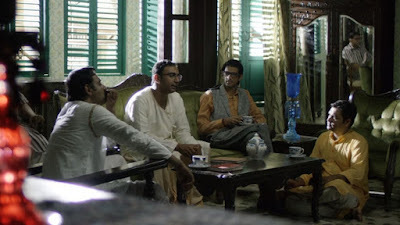 At this point Chandrakant’s discussion group of men hold a bachelor’s party to “celebrate” Vinod’s upcoming marriage to Kamal. 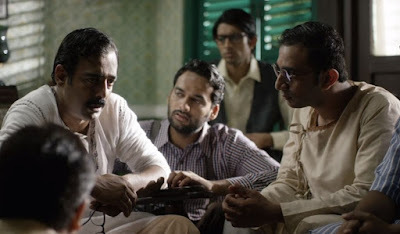 This is one of the most amusing scenes in the film, because it is evident that Vinod’s companions, far from celebrating the event, are actually mourning what they see is the inevitable loss of freedom that will come to Vinod’s married life. And in fact, shortly after the wedding ceremony, the marriage of Vinod and Kamal starts to fall apart due to Vinod’s many incessant complaints and insensitivities. Soon Kamal runs away to live in her parents’ home. The Chandrakant and Khantamani relationship has also been breaking down and has descended into quarrels. Finally Khantamani has had enough; she packs her bags and leaves her husband. Chandrakant, however, is so fed up with Khantamani’s bad temper and constant nagging that he celebrates his newfound freedom. Meanwhile Gaudai has been stalking the grounds outside the home of his supposed Kadambani, but he never sees the woman he loves. His father happens upon him onetime and summarily informs him that he has arranged for him to marry Indu. This news greatly distresses Gaudai, and he timidly informs his authoritarian and hot-tempered father that he cannot marry Indu because he loves Kadambani (although we know that the woman he actually loves is Indu, who he wrongly thinks is called “Kadambani”). Back in her original family home, Kamal is soothed by her sister Indu. Speculating that Vinod’s insensitivity might be due to his having other love interests, she composes a phoney love letter from an admirer to Vinod and signs it, “Kadambani”, a name she drew out of the air. The letter proposes a secret meeting with Vinod in the park. However, when Gaudai visits Vinod and happens on the letter, he assumes it was written by his Kadambani, and he is crushed. Indu coerces her friend Rajni (Natasha Pillai) to pretend to be Kadambani at the meeting. Vinod, accompanied by Gaudai, reluctantly goes to the meeting, but when he sees the woman he tells her that he truly loves his wife, Kamal. This assertion is eventually reported back to Kamal. And when Gaudai saw Rajni, he could see that she is not his “Kadambani” (whom we know, but he doesn’t, is actually Indu). So Indu’s continued schemes of misidentification actually help, on this occasion, to move two relationships closer to reconciliation. Seeking to do the right thing, Gaudai’s father, Shibhcharan, now tracks down the real Kadambani’s father, Chowdhari Babu (Sameer Chandra), and arranges for Gaudai to marry that woman. Meanwhile Kamal learns from her sister Indu that the man she loves (whom she mistakenly calls “Lalit”, but who is actually Gaudai) mistakenly thinks that she, Indu, is named “Kadambani” (recall, she had once foolishly told him that). So Kamal dutifully goes to Chandrakant and tells him to explain things to Lalit. When Chandrakant talks to Lalit, though, the bewildered young man says he has never even heard of Kadambani or Indu. When these denials get back to Indu – that her beloved cannot remember even meeting Indu – the news breaks the poor woman’s heart. Now people start coming together to try and resolve all this zany confusion – both in the world and in their hearts. At Chandrakant’s poetry club, his friends see that he is miserably lonely for his departed wife. They try to console him, but Chandrakant worries that is too late and that Khantamani probably won’t come back to him. Just then the still distressed Indu barges in and demands to see Lalit, who she cannot believe does not even remember her. But when she looks over the group of men there, she finally sees that the man she truly cares about is actually Gaudai, not Lalit. So Indu and Gaudai are finally connected together. But there are still major problems to be resolved. Gaudai’s dictatorial father, Shibhcharan, now arrives to take Gaudai to Chowdhari Babu and the real Kadambani in order to carry out the arranged wedding. When Gaudai tells him he can’t go because he really loves Indu (the girl with whom an earlier arranged marriage (in Section 2) had been setup for him and which Gaudai had mistakenly rejected), Shibhcharan loses his temper. He and Chowdhari Babu both stubbornly insist that Gaudai must now go ahead and marry Kadambani. And Chowdhari Babu warns he will take legal action to ensure this wedding commitment is enforced. But just then Chandrakant comes up with an idea. He tells Chowdhari Babu and Shibhcharan that Gaudai and Indu are already married! He makes up the story that the couple had a Gandharva marriage, which is an hoc type of marriage “based on mutual attraction between two people, with no rituals, witnesses or family participation” that is part of the classical Hindu tradition . Chowdhari Babu and Shibhcharan reluctantly have to accept this state of affairs, and Chowdhari Babu is further appeased when the real Lalit comes forward and agrees to marry Kadambani. Now Gaudai and Indu are united at last, and the parents are happy. Meanwhile Kamal, newly assured of her husband’s love, returns home, and she and Vinod are reconciled. In the final scene, Khantamani returns home and sees her husband Chandrakant packing his suitcase for a trip. She tearfully asks if she can go with him, and he joyfully accepts. So everyone finally ends up happy in this rather contrived tale. We are dealing with people who fall in love based on fleeting glances or songs, and there are no personal, intimate interactions that could provide more substantial material to kindle a loving relationship. And this lessens the seeming depth and authenticity of these amorous expressions of love. What seems to be emphasized here instead is the need to respect the individual autonomies of those participating in (or are about to participate in) a marriage relationship. This rather complex story has been described as hilarious and a “laugh riot” by one reviewer . I wouldn’t go that far, but I was charmed by the enthusiastic performances on the part of the cast, and the effective manner in which the various dramatic elements were woven together. Durga S, “Shesh Rokkha (Dhai aakhar prem ka" – Stories by Rabindranath Tagore (8)”, Writersbrew, (3 March 2016). “Gandharva marriage”, Wikipedia, (21 January 2019).